On a warm December day in Los Angeles, I sat down with Nicole Dean, the iced tea entrepreneur. She carried a sleek white triangular bag with black lace handles and a simple wire-thin letter “K” etched on the outside. The bag seemed more in line with products from Tiffany’s than from Twinings. Perfectly spaced in the three corners of the bag were three tall, sleek glass bottles of iced tea. Dean pulled them out and placed them on the table in a row. The bottle was adorned with a few sentences describing the tea, above which stood the same wire-thin letter “K”. “K” for “Kollo”, her new ready-to-drink bottled iced tea company. When it comes to bottled iced tea on the market, it’s safe to say that quality isn’t the most important factor; it primarily comes down to convenience. Customers want an iced tea that they can grab quickly, drink on the go, and discard when they’re done. Since it’s meant to require very little effort, we expect this experience to be cheap. These criteria aren’t very conducive to high-quality tea. But what if someone wanted to change this experience? What if someone fell in love with high-quality, single origin, specialty teas and wanted to expose customers to their superior taste? What if someone wanted to brew and bottle these teas as purely as possible, without preservatives, without pasteurization? That was Nicole Dean’s vision for Kollo. Dean fell in love with tea while completing her MBA in Healthcare Leadership. Unable to tolerate coffee, and needing the caffeine to keep running, she fell down the proverbial tea rabbit hole, like so many of us tea-fanatics. Her rigorous academic background taught her how to discover, research, and process the huge amount of information the tea world has to offer. After working in La Jolla, California as a Regenerative Medicine Biotechnician for a number of years, she decided to plunge fully into the tea business. She jump-started her endeavors with a trip to Japan in 2014 to personally source her first tea. It’s been a journey since 2014 to the present and Dean finally feels that Kollo is ready for the tea industry at large. Her minimalist product line consists of only three teas, personally selected from the source: a Japanese green (brewed from a kabusecha), a Vietnamese medium-dark oxidized oolong, and a Chinese black tea. All the teas are single-origin and cold-brewed for 24 hours at Kollo’s Los Angeles facility before being hand bottled in 500 ml, spirit-grade French glass bottles. No sugar, no preservatives, no pasteurization. Dean’s love of minimalist design is apparent in the branding and marketing. The bottles say very little, leaving the full grandeur of the tea on display. For instance, the label distinguishing the oolong tea simply says, “Whole Leaf + Organic + Single Source”, then under that, “Oolong Tea”. Furthermore, the tasting notes on Kollo’s website describe the black tea as, “Cocoa, Dark Fruit, Nuts”. The point is to let the tea speak for itself, and I have to say…it certainly does. As someone who’s experimented with cold brewing teas for many years, I can attest that it’s a difficult process and takes time to perfect. But all three Kollo teas were perfectly balanced and absolutely delicious. The green was rich, sweet, and umami with just a hint of astringency to remind you it’s a Japanese green. The oolong had a light floral characteristic and buttery finish. The black tea was stellar, and with the breadth of bottled black teas on the market, it’s immediately apparent that there’s nothing like it out there. The main appeal of Kollo isn’t just the flavor, but the lifestyle choice it suggests. Even so, Kollo prioritizes flavor by using specialty tea, unlike practically every other ready-to-drink bottled iced tea out there. Kollo is designed to be a luxury, and the retail price certainly reflects that at $10-$12 a bottle. Those that want the pure simplicity of quality iced specialty tea, but want it to be elegant as well, now have a brand to turn to. This is apparent in where Kollo has popped up: they launched exclusively for sale in Brentwood’s trendy market/restaurant/bakery Farmshop. They’ve worked with Chanel, United Talent Agency, SoHo House, and were featured in a newsletter from Gwyneth Paltrow’s Goop, just to name a few. Does this mean you’ll see Kollo coming to a specialty food store near you? 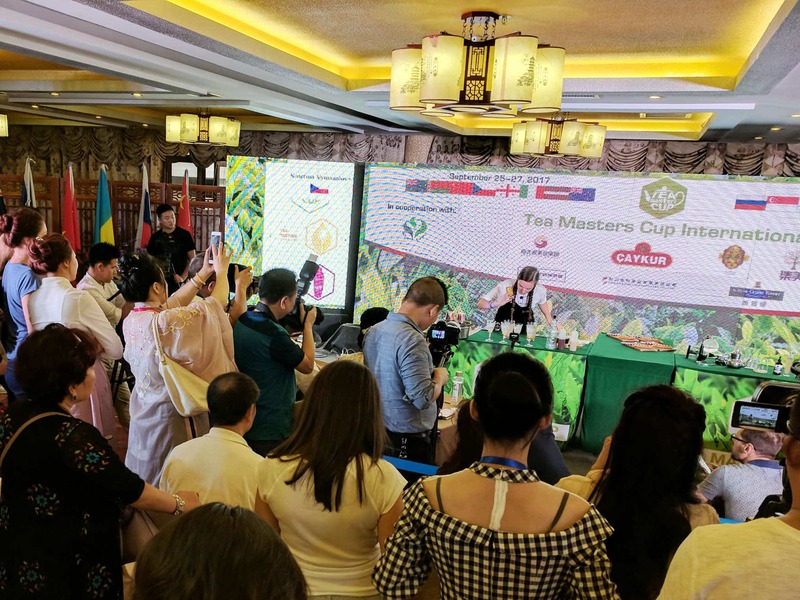 Dean calls herself a “cautiously optimistic person” and simply wants to see Kollo as a piece that fits into the larger trend she sees as the expanding tea market in the US. She told me, “a rising tide lifts all boats,” and believes that the next wave of tea consumer culture is upon us. She credits her own experience discovering a larger world of tea as an example for others. Ultimately, Dean means to give tea converts a better option, but what this means for Kollo is yet to be seen. All I know is that it’s absolutely delicious. I’m not sure I understand this. When I steep tea at home, I’m not supposed to keep it more than a few days. How is this overkill of a product going to last without pasteurization? Something isn’t right with this picture. As someone who’s extensively cold brewed and stored brewed tea in various ways for many years, I can attest that as long as your streamline is sterile, then everything should be fine. Sure, the product may taste flat after a week or two, but pasteurization will surely make a cold-brewed tea taste even flatter. And in so denying that pasteurization, she’ll have a very hard time getting this product into mainline stores, which typically require it. For now, this is limited to boutiques and private events. But all you really have to do is look to the plethora of cold-brewed coffee products on the shelves to see that cold-brewing without pasteurization is absolutely possible and marketable, since nearly none of them do it. Yeah, I’m not personally worried about pasteurization, but like you said, getting this into regula stores is going to be rough. I suspect that this will appeal more to the person who likes “exclusive” things that nobody else can afford than it will to most tea enthusiasts. I’d try it if I saw it in a store, but I don’t think I could ever convince myself that I’m drinking anything more than tea with a drastically marked up price. Still, I’ll try any tea once!